In addition to serving as chief administrator for Northwestern’s current Master of Education degree programs, Dr. Waring-Tiedeman works with the college’s education department to develop new M.Ed. tracks and graduate-level programs. Before coming to Northwestern, she was the school support and ESL specialist for the East Dakota Educational Cooperative in Sioux Falls and also served as a contract specialist and data analyst for edCount, which is based in Washington, D.C., and provides systems and services for educators across the U.S. Dr. Waring-Tiedeman has taught at South Dakota State University and Arizona State University and also has experience as a teacher of English as a second language. She previously served on the executive board for the Council for the Accreditation of Educator Preparation. 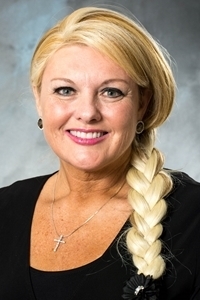 She earned a doctorate in educational administration, specializing in educational leadership and adult education, at the University of South Dakota. She also holds a Master of Education degree in curriculum and instruction and a bachelor’s degree in English, both from South Dakota State University.